Recently we had a customer try and use the Test Case Import Utilities for Visual Studio 2012 and Visual Studio 2010 with TFS 2013 but it would crash. So I created a clean Windows 8.1 VM in Azure to see what it takes to get past this error. First I wanted to duplicate the error so the first thing I did was download the Test Case Import Utilities for Visual Studio 2012 and Visual Studio 2010 from http://tcmimport.codeplex.com/. 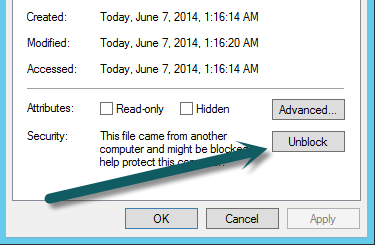 Make sure and right click on the zip and select Properties so you can unblock it. The application starts right up as expected but I can’t load my spreadsheet. That is to be expected because this is a clean Windows 8.1 and does not have office on it. So I install Office Professional Plus 2013 with SP1. I can now load my spreadsheet but when I click Next the application crashes just as it does for our customer. Perfect! I was able to duplicate the issue and now I can fix it. Step 1. Install Team Explorer 2013 update 2 or later. Once it was installed I connected to my VSO account to make sure I could connect. I attempted to use the application with the same results. Step 2. Install Team Explore 2012. I could not connect to VSO after just installing Team Explorer 2012. Step 3. Download Update 4 of TFS 2012. After I installed the Update I could connect to VSO. Now when I run the Test Case Import Utilities for Visual Studio 2012 and Visual Studio 2010 every works as expected!